To qualify for RYA Competent Crew or Day Skipper certification, you must either complete 5 straight days or over 2 weekends that include a Friday or Monday, or three weekends (6 days in total) aboard an RYA training yacht and this must include living aboard. For Coastal Skipper, you will need to complete the 5 day course in straight 5 days. Our practical courses run from March to December. You choose the dates that suit you then contact us to book your preferred dates. Once you have booked your dates, print out the booking form and send it to us with your payment. Practical Sailing Days usually run on weekdays from 09:00 to 16:30. The cost is £125 per person and includes light refreshments and lunch. Ladies’ Days with an all female crew and instructor are organised from time to time. Please contact us for more information. 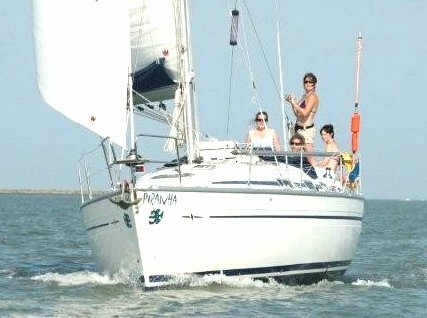 Two Day Start Yachting Courses usually start on Fridays 20:00 to Sunday 16:30. The cost is £245 per person and includes light refreshments, breakfasts and lunches. Five Day Comp Crew/Day Skipper/Coastal Skipper CoursesThese usually start on Sunday at 20:00 and finish on Friday at 16:00. The cost is £560 per person for Competent Crew level and £585 for Day Skipper and Coastal Skipper levels. Prices include light refreshments, breakfasts, lunches and two evening meals were applicable. If you prefer to do three weekends rather than 5 straight days, the price is £680 for Competent Crew and £690 for Day Skipper and Coastal Skipper. You will be on the boat for six days in total. Special Events, bareboat charter and corporate days are priced accordingly. Also see details of our winter Shorebased courses.